PPC, or pay per click, is a popular online advertising model running on search engines, content websites, blogs and other advertising networks. Now even some Social Media are using these channels to drive targeted audience to your company page or website within their network. With this tool, advertisers need to pay only when someone clicks on their ad. Websites using pay per click advertisements display an ad when a query matches the keyword list of the advertiser. Advertisers must estimate the value of each click, based on the kind of traffic they are expecting from a source. This determines the potential gains for an advertiser. Thus, targeting the right market is an essential part of a pay per click campaign. The traffic must be interested in the offer and have the intention of purchasing the product. In addition, the location of the traffic (geo targeting) and the time when it is browsing are also crucial factors. Budget option: A PPC campaign can be budgeted on a daily basis. Not always the cheapest option but a quick fix until the organic search engine optimisation kicks in. This helps in adjusting spending according to performance. Pay per click advertising, unlike traditional methods, guarantees that you pay only for relevant traffic. Since every click represents the decision of a user to land on your site, every visitor is a lead. Works well with SEO: A balance between PPC and SEO works well for formulating a keyword strategy. 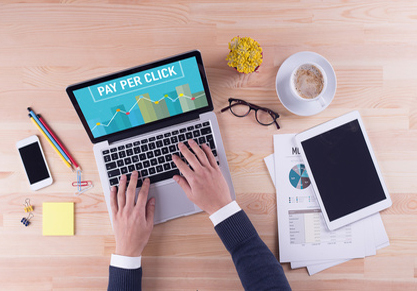 Running a pay per click campaign is the best way to collect data that can help prioritize keywords that perform. This process is fast and enables the user to try countless keyword variations. In this way, one’s SEO campaign can also be tracked and can bring more relevant and convertible traffic to the website. Instant traffic: This internet marketing technique is recommended for new websites. As compared to search engine Optimisation which may take months to show results, PPC delivers immediately. If managed well, the pay per click technique can give significant results in as short a period as a few minutes. All of them operate on a complex formula based on the bid price and certain quality score (for instance, how relevant is the keyword to your website/landing page). This, along with the relevancy of the landing page and the ad quality score, determines the position of the ad. We are a digital marketing agency who like to work with a wide range of clients. We understand the power of the web. That's why we put every ounce of our professional energy and expertise into creating the perfect shop window for your business, at an affordable price, maximising search engine capability to deliver the results you need.